The articles published in Family Medicine & Medical Science Research have been cited 61 times by eminent researchers all around the world. 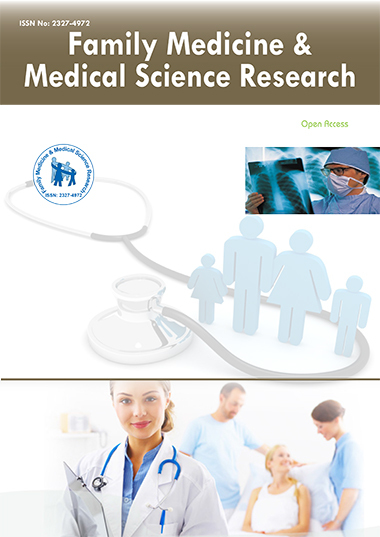 Following is the list of articles that have cited the articles published in Family Medicine & Medical Science Research. Gazzinelli MF, de Souza V, da Fonseca RM, Fernandes MM, Carneiro AC, et al. (2015) Práticas educativas grupais na atenção básica: padrões de interação entre profissionais, usuários e conhecimento. Revista da Escola de Enfermagem da USP 49: 284-91. Kutcher S, Wei Y, Hashish M (2016) Mental Health Literacy for Students and Teachers: A “School Friendly” Approach. Positive Mental Health, Fighting Stigma and Promoting Resiliency for Children and Adolescents 24:161. Gazzinelli MF, Souza VD, Fonseca RM, Fernandes MM, Carneiro AC, et al. (2015) Educational group practices in primary care: interaction between professionals, users and knowledge. Revista da Escola de Enfermagem da USP 49: 0284-0291. Katzman MA. Professional Positions (current). McManus DD, Rong J, Huan T, Lacey S, Tanriverdi K, et al. (2017) Messenger RNA and MicroRNA transcriptomic signatures of cardiometabolic risk factors. BMC genomics18:139. Hecksteden A, Leidinger P, Backes C, Rheinheimer S, Pfeiffer M, et al. (2016) miRNAs and sports: tracking training status and potentially confounding diagnoses. Journal of translational medicine 4:219. Zangrando J. Implication des ARNs non codants dans l’infarctus du myocarde et le remodelage ventriculaire post-infarctus (Doctoral dissertation, Université de Lorraine). Liao J, Liu Y, Wang J (2016) Identification of more objective biomarkers for Blood-Stasis syndrome diagnosis. BMC complementary and alternative medicine 16: 371. Jakob P, Kacprowski T, Briand-Schumacher S, Heg D, Klingenberg R, et al. (2016) Profiling and validation of circulating microRNAs for cardiovascular events in patients presenting with ST-segment elevation myocardial infarction. European Heart Journal 23: ehw563. PienimaekiâÂÂ Roemer A, Konovalova T, Musri MM, Sigruener A, Boettcher A, et al. (2016) Transcriptomic profiling of platelet senescence and platelet extracellular vesicles. Transfusion. Bijak M, Dzieciol M, Rywaniak J, Saluk J, Zielinska M (2016) Platelets miRNA as a Prediction Marker of Thrombotic Episodes. Disease Markers. Sunderland N, Skroblin P, Barwari T, Huntley RP, Lu R, et al. (2016) MicroRNA Biomarkers and Platelet Reactivity. Circulation Research 120: 418-35. Gallego JG. Aging and Cardiovascular Risk. Clancy L, Freedman JE. Blood-Derived Extracellular RNA and Platelet Pathobiology. Wallace RG, Twomey LC, Custaud MA, Moyna N, Cummins PM, et al. (2016) Potential diagnostic and prognostic biomarkers of epigenetic drift within the cardiovascular compartment. BioMed research international. Coskunpinar E, Cakmak HA, Kalkan AK, Tiryakioglu NO, Erturk M, et al. (2016) Circulating miR-221-3p as a novel marker for early prediction of acute myocardial infarction Gene 591: 90-96. Bertoia ML, Bertrand KA, Sawyer SJ, Rimm EB, Mukamal KJ (2015) Reproducibility of circulating microRNAs in stored plasma samples. PloS one 10: e0136665. Shah R, Tanriverdi K, Levy D, Larson M, Gerstein M, et al. (2016) Discordant expression of circulating microRNA from cellular and extracellular sources. PloS one 11: e0153691. Ahlin F, Arfvidsson J, Vargas KG, Stojkovic S, Huber K, et al. (2016) MicroRNAs as circulating biomarkers in acute coronary syndromes: A review. Vascular pharmacology 81: 15-21. Bekris LM, Leverenz JB (2015) The biomarker and therapeutic potential of miRNA in Alzheimer's disease. Neurodegenerative disease management 5: 61-74.